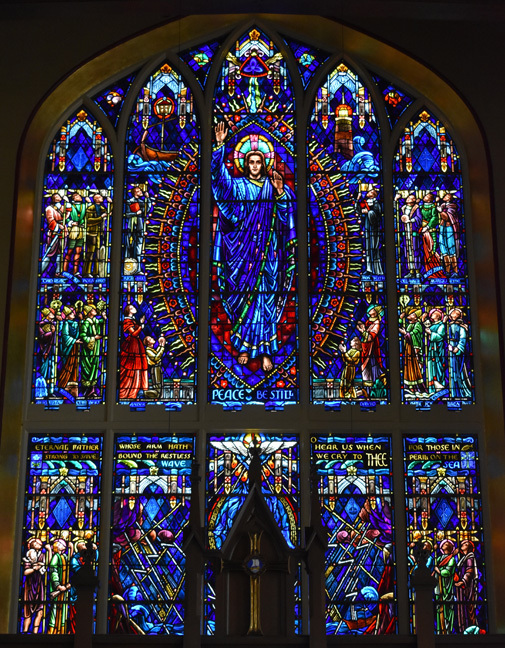 "This great window has been conceived as the focal center of all the beautiful stained glass and other decorations of Mariner's Church. 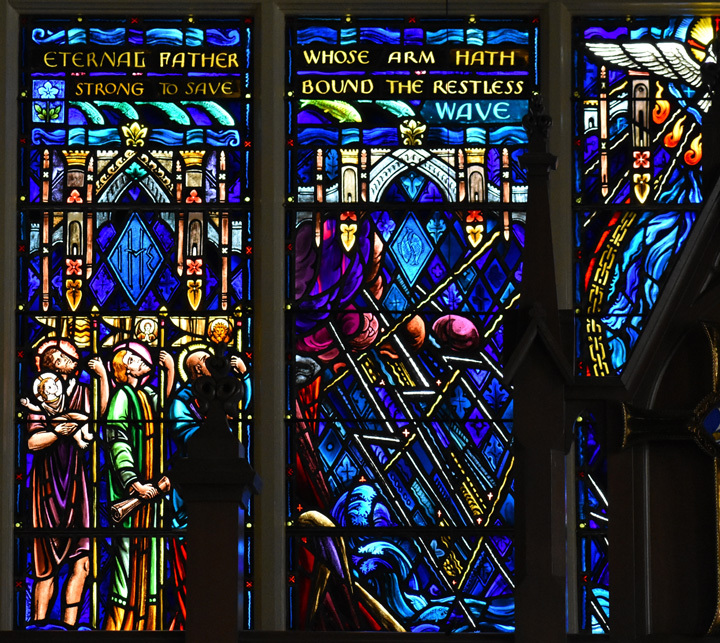 Appropriately it has been centered around the theme of the Mariner's Hymn, "ETERNAL FATHER, STRONG TO SAVE, WHOSE ARM HATH BOUND THE RESTLESS WAVE; O HEAR US WHEN WE CRY TO THEE, FOR THOSE IN PERIL ON THE SEA". 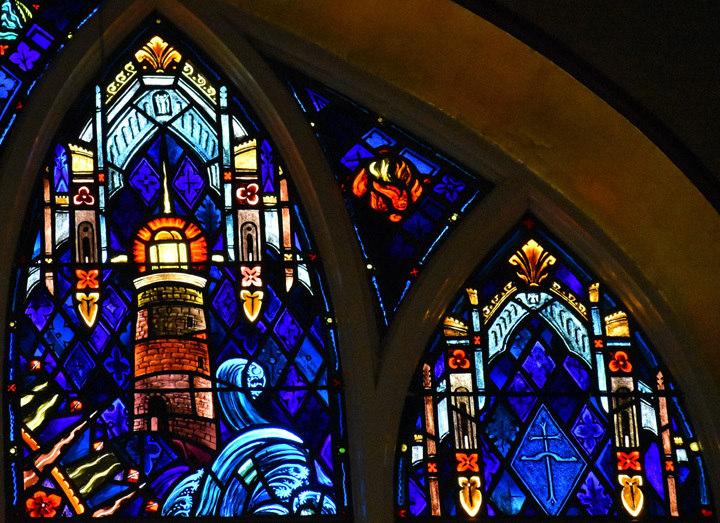 The first stanza of this hymn appears in a band across the center area of the window. 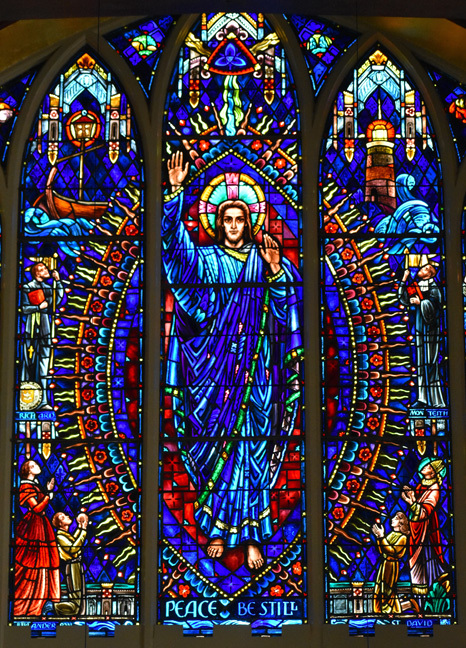 The great center of the window itself is the figure of our Lord, reigning in glory, and surrounded by the great aureola, or vesica, form which in this case reminds us as well of the form of the ship itself. 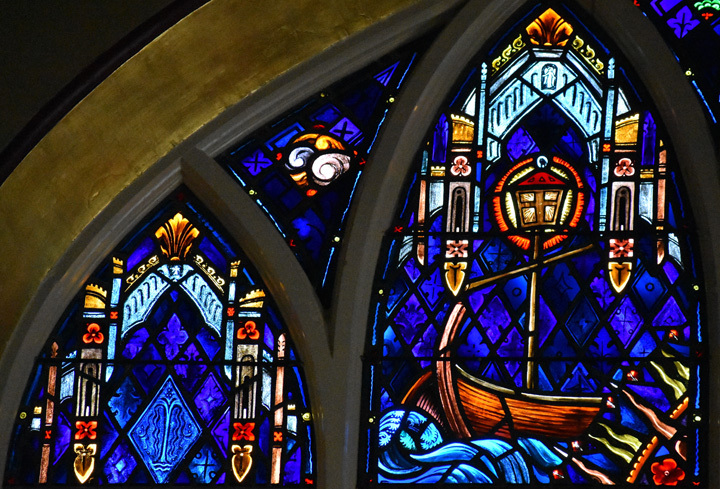 In the panel below the center the arm of the Father is seen stilling the waves in the tempest and encircling the Anchor of Hope, based upon the shape of the Cross of Christ. 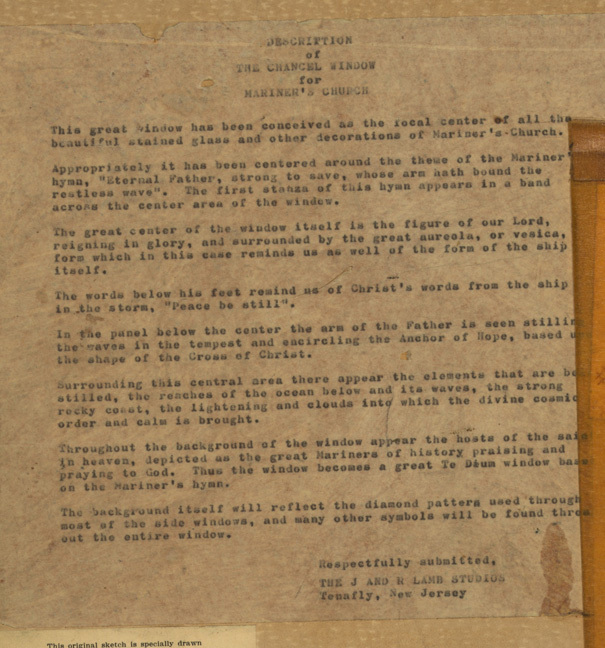 Surrounding this central area there appear the elements that are being stilled, the reaches of the ocean below and its waves, the strong rocky coast, the lightening and clouds into which the divine cosmic order and calm is brought. 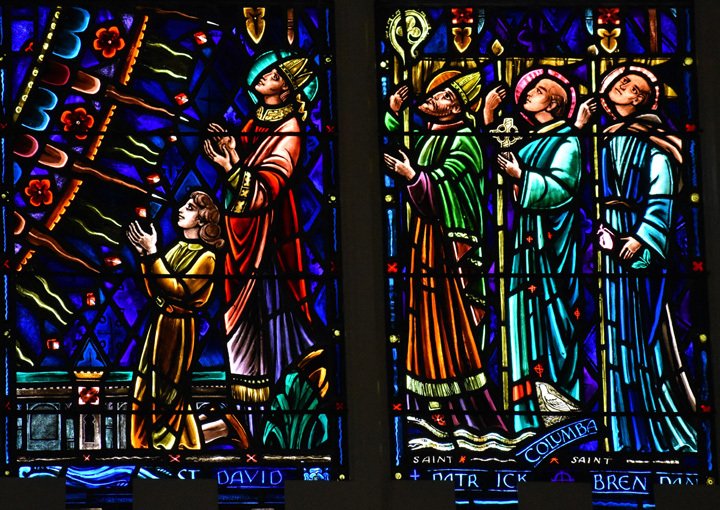 Throughout the background of the window appear the hosts of the saints in heaven, depicted as the great Mariner's of history praising and praying to God. 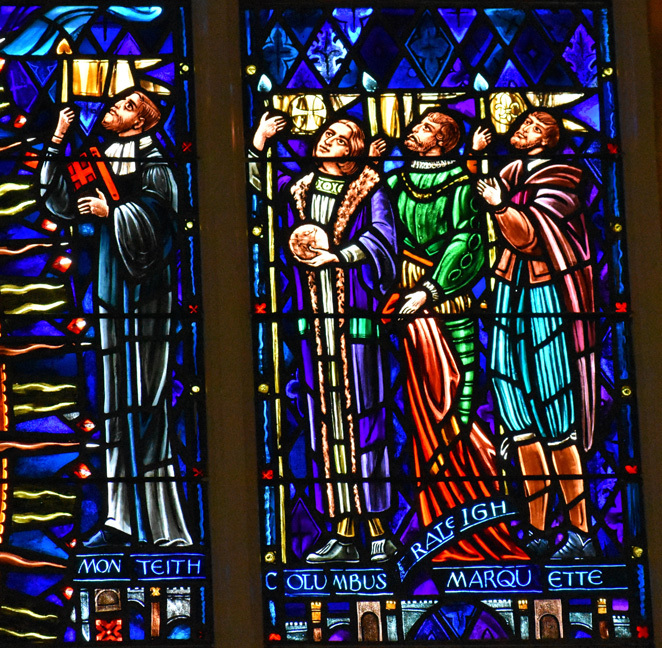 Thus the window becomes a great Te Deum window based on the Mariner's Hymn. 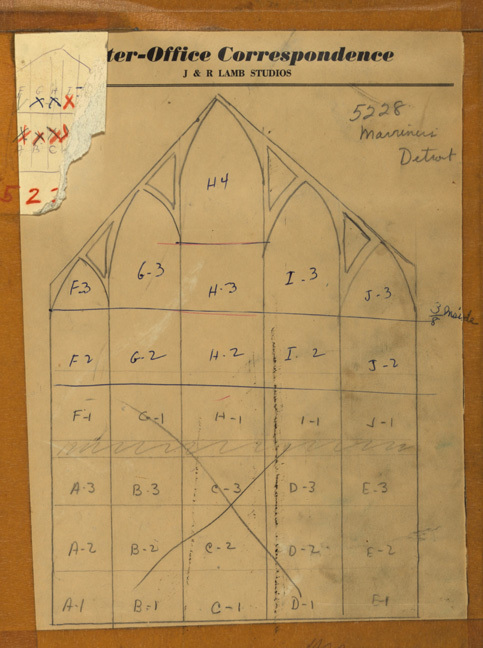 The background itself will reflect the diamond pattern used through most of the side windows, and many other symbols will be found throughout the entire window." 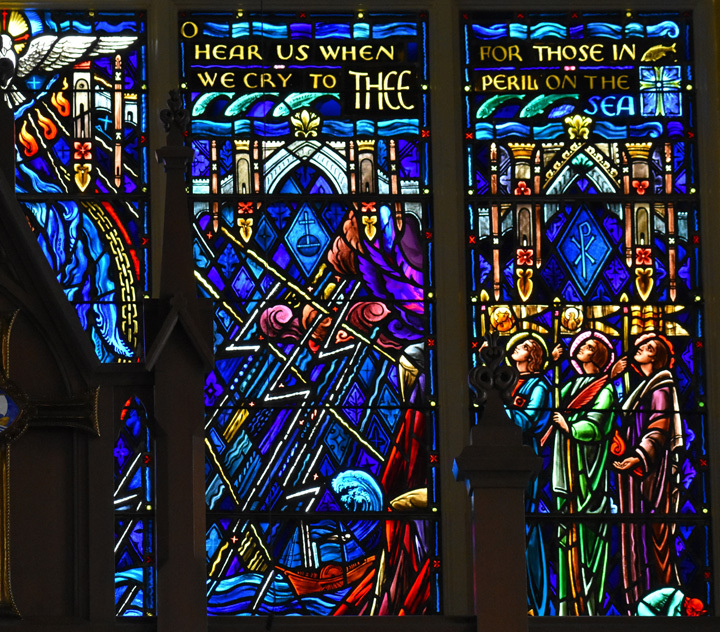 The names of the figures have been inscribed on the window. 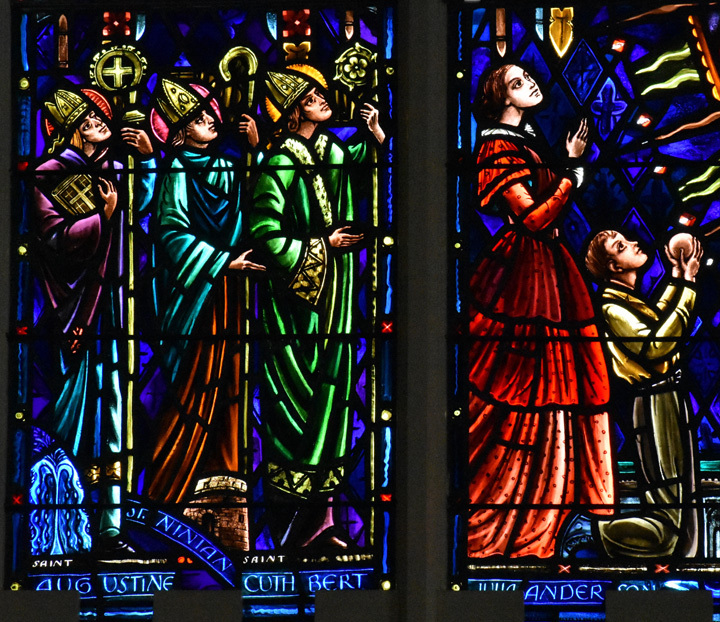 A few are of local interest ---- Julia Anderson (1793-1842) founder of Mariners' Church, Rev. 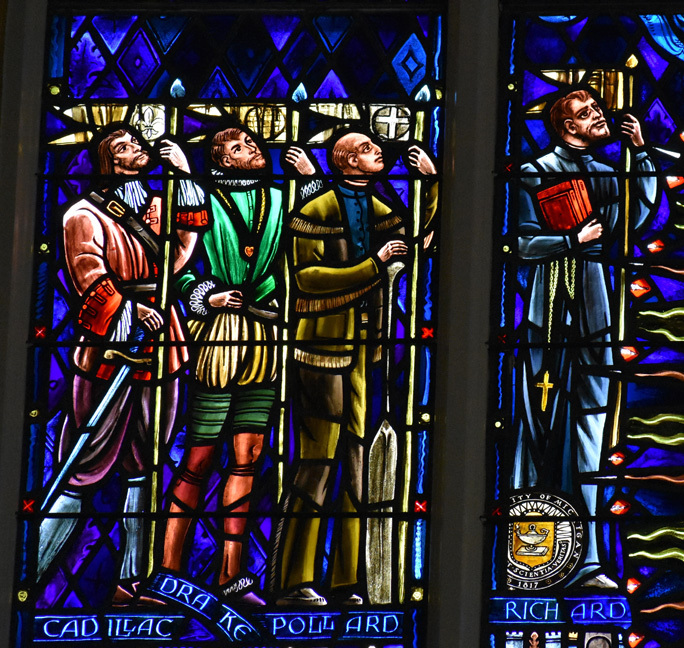 Richard Pollard (1752-1824) Anglican priest instrumental in the foundation of the Diocese of Detroit, Gabriel Richard (1767-1832) Catholic priest, noted educator and a founding father of the University of Michigan, John Monteith (1788-1868) Presbyterian minister, a noted abolitionist and a founding father of the University of Michigan. 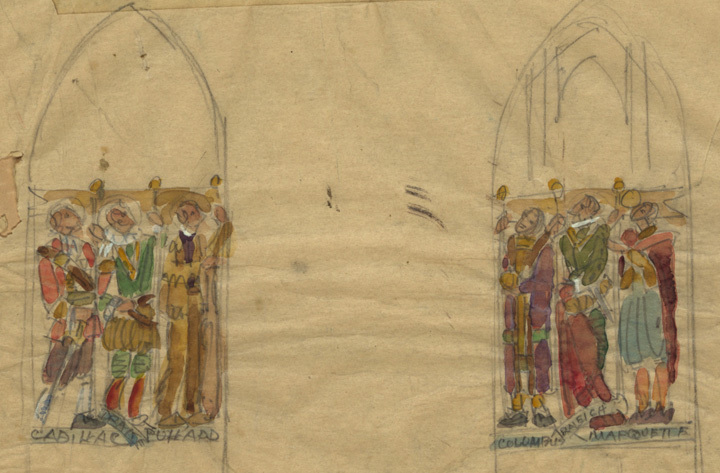 The artist, Katherine Lamb Tait, signed her name at the bottom right of the window as "K. Lamb T."; under her name is "des. 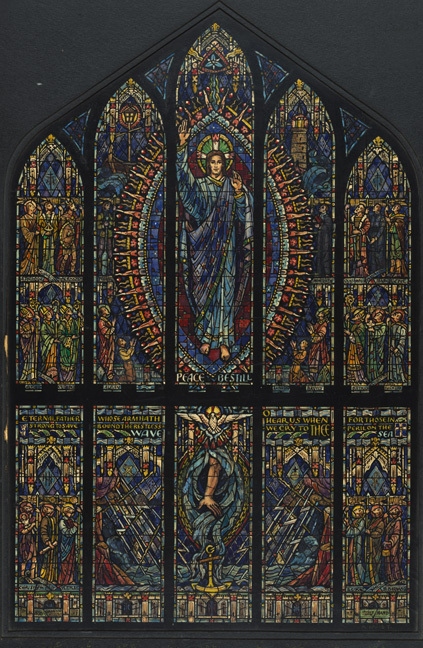 + pinx(it)" which indicates that she was both the designer and painter for this window.